A Catholic priest was stabbed while celebrating Mass in Montreal Friday morning as stunned parishioners looked on, according to officials and video footage. The horrifying incident, which authorities said was not terror-related, unfolded just before 9 a.m. at the historic St. Joseph's Oratory, leaving Father Claude Grou, 77, with lacerations to his upper body, according to Montreal police spokeswoman Caroline Chevrefils. He was rushed to a local hospital where he was listed in stable condition, according to the Montreal Diocese. "There was a man, a young man, who stood up and, quickly, went to the front, into the sanctuary, behind the altar where Abbé Claude Grou was standing," witness Philip Barrett told The Montreal Gazette. "No one was sure what exactly was happening and I saw the priest move a bit, farther away from this person." 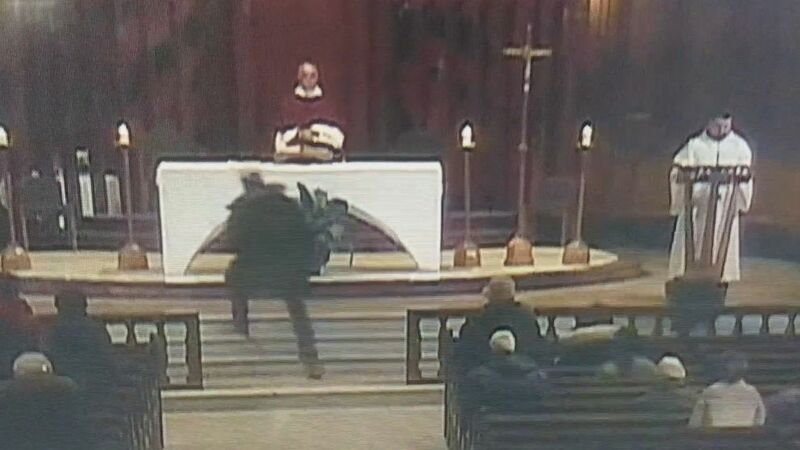 The alleged assailant, a 26-year-old, can be seen on video footage running up onto the altar, knocking over a candle and then attacking the priest with a sharp object. He was then detained by church security until police arrived, Chevrefils said. The television channel broadcasting the service live told ABC News it cut the feed soon after the stabbing took place. In a statement, the channel, Salt + Light, apologized for "the interruption of the live mass ... due to a serious incident." The priest was released from the hospital late Friday, CTV reported. The suspect was taken to a detention center where he will be met by investigators this afternoon, police said. He is expected to appear in court, via video, on Saturday afternoon. Montreal Mayor Valérie Plante called the attack a "horrible and inexcusable gesture that has no place in Montreal." "What a horrible attack at Saint Joseph's Oratory in Montreal this morning," Canadian Prime Minister Justin Trudeau tweeted. "Father Claude Grou, Canadians are thinking of you and wishing you a swift recovery.